Homepage » Trade News » License to Kill: Should China Grant Foreign Tourists Visas to Hunt Limited Numbers of Protected Species? License to Kill: Should China Grant Foreign Tourists Visas to Hunt Limited Numbers of Protected Species? While trophy-hunting tourism has largely been out of the news for the past five years – since public anger forced a halt to the first and only auction of international hunting quotas – the debate has been quietly raging on: does allowing select hunting ultimately benefit wildlife, or lead to disaster? …Wang Wei is president of China’s largest international hunting firm, Beijing-based Zheng’an Travel Agency, also known as China Adventure Travel. Speaking at an event organised by Beijing-based NGO Green Beagle, he said that allowing foreigners to hunt – and then passing on the resulting income to locals – can help drive down poaching rates. From 1988 to 2006, the Dulan International Hunting Ground paid 4 million yuan (US$625,000) in taxes on income from “limited hunting”, with 2.8 million yuan (US$437,000) of that channelled into local wildlife protection, according to the People’s Daily. Others argue that these numbers are unimpressive given the scope of the issue. 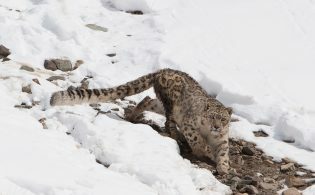 Many Chinese in conservationist circles claim the money has not been adequately diverted to enviromental causes and also state that not enough information on these animals is available to know no overarching harm is being done to their populations. To read detailed accounts of both sides of the debate, read the entire article in chinadialogue.